The idea that a diagnosis/label of autism may have repercussions for quite a few more people than just the person diagnosed is not a new one. Without trying to generalise nor stigmatise, the process of working up to and receiving a diagnosis on the autism spectrum can often have profound consequences for family life. Parents typically shoulder quite a lot of the additional duties that follow from a diagnosis (and indeed before diagnosis) but other family members also have to play their part. When it comes to the possible 'impact' of receipt of an autism diagnosis on some of those other family member, science is starting to come around to the idea that siblings in particular, might need a little more support. So it was found in the paper by Brian Lovell & Mark Wetherell  who reported findings based on the examination of "the psychophysiological impact of childhood ASD [autism spectrum disorder] on siblings." Looking at a variety of measures including those measuring depressive symptoms and cortisol levels, researchers compared values for "25 siblings of children with ASD (and their mothers) and a control group of 20 siblings of neuro-typical children (and their mothers)." They found that depressive symptoms were elevated for the ASD sibling group but when it came to cortisol measurements "groups were comparable on all cortisol indices." They concluded by suggesting that more needs to be done to tackle the "greater emotional problems and overall depressive symptoms" noted in the ASD sibling group. Cortisol, I might add, has been talked about with autism in mind before (see here) bearing in mind 'issues' emerging as to when the best time for collection should be with autism in mind . There are a couple of ways that such results can be interpreted. One could argue that the increased frequency of 'emotional issues' and depressive symptoms noted in the ASD sibling group might well be associated with their sibling ASD label and much of what comes with it. Again avoiding any sweeping stigmatisation of autism, this is a serious matter and reiterates how the impact of autism goes well beyond that of personal experience when it comes to affecting family and other loved ones. The other way one could interpret this data is by suggesting that within the scope of the broader autism phenotype (BAP) - that is, the idea that around the diagnostic edges of autism there may be a spectrum of more subtle presentations (see here) - [some] siblings may already be more prone to emotional and/or depressive issues on the basis of how depression for example, shows some pretty strong links to autism (see here for example). Without any psycho-babble explanations, one could foresee how an increased tendency towards depressive symptoms or depression might be to some degree compounded by the lived experience of having a sibling diagnosed with ASD; particularly if and when there is significant disruption to typical family life. I might also acknowledge that autism does not normally reside in some sort of diagnostic vacuum (see here) so one has to be mindful that other behaviours outside of autism might also be contributory to any additional family stress. Irrespective of the whys and wherefores, the idea that other family members may require additional support as well as children/adults diagnosed with an ASD is paramount. As I've previously discussed on this blog, support can take many guises (see here) as this authorship team have previously discussed ; some of which could be transferable to siblings too. Other research has looked at issues such as family adaptation  and I'm minded to bring in the concept of resilience too. That also having a sibling diagnosed with ASD may be a significant influence on career choices of unaffected siblings (unaffected in terms of symptom presentation) is an additional variable to take into account, save any charges of me painting a too one-sided, negative picture of the possible familial effects of autism. 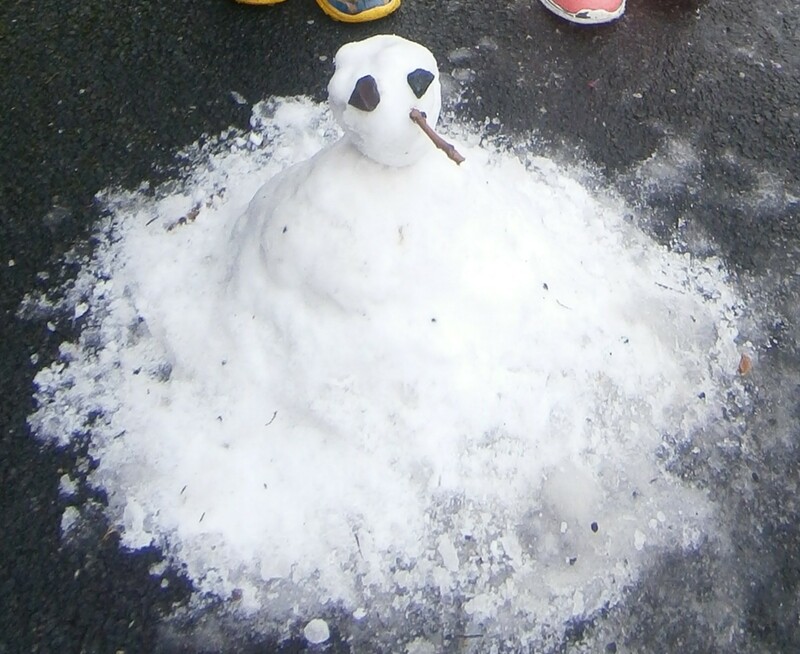 The picture included in this post by the way, represents a nearly full weekend attempt by some of my brood to muster enough 'snow' to put together this marvellous fellow. Don't you just love winter? Lovell B. & Wetherell MA. The psychophysiological impact of childhood autism spectrum disorder on siblings. Res Dev Disabil. 2015 Dec 22;49-50:226-234. Sharpley CF. et al. Is afternoon cortisol more reliable than waking cortisol in association studies of children with an ASD? Physiol Behav. 2015 Dec 21. pii: S0031-9384(15)30217-1. Lovell B. et al. With a little help from my friends: psychological, endocrine and health corollaries of social support in parental caregivers of children with autism or ADHD. Res Dev Disabil. 2012 Mar-Apr;33(2):682-7. O'Brien S. Families of Adolescents with Autism: Facing the Future. J Pediatr Nurs. 2015 Dec 19. pii: S0882-5963(15)00352-8.